Hermesetas saccharin sweetener is a European favourite. Hermesetas is sold in over 100 countries especially in the UK, Scandinavia and southern Europe. Just drop a saccharin tablet into your tea or coffee, and enjoy. 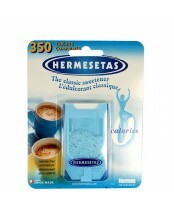 Each Hermestas tablet has zero calories, while offering the sweetening strength of one teaspoonful of sugar.